Driving into garage where there is little room for error? The length of available space to park inside the garage is 170 inches and the car is 162 inches. Thus leaving 8 inches maximum of room for error. If drive too far forward the car hit the wall. If drive not far enough in, the garage door hit the car on way down. How to be able to park inside the garage within that 8 inch room for error each time without having to get out of the car to make sure it's parked satisfactorily? This, put into the floor or block of wood. Drive up to it, just till you tap it. Then stop. Resist the urge to back up. Edit - I changed from a driveway marker image to my 'in the wild' image from my garage. I made 2 of these, and have used both for 10+ years. It's positioned to both protect the steps from getting smashed and to allow enough clearance to walk in front of the car. A common solution I have seen is to have a tennis ball (or similarly soft item) that can be hung from the ceiling. (You may be able to purchase a kit made for this purpose.) With the assistance of another person, drive your vehicle into the garage to a place where you have clearance on both sides. Fasten a string to both the ceiling and your tennis ball. The ball should hang down and just touch your windshield (windscreen). Upon returning, drive into the garage just enough to touch the tennis ball to the windshield. You should be positioned with enough clearance to not damage the wall or the garage door. Some trucks and buses have a mirror to eliminate the front blind spot. Reverse the principle - attach any old mirror to the wall/ceiling. Might need a bit of trial and error (and a tall friend) to get the best position. 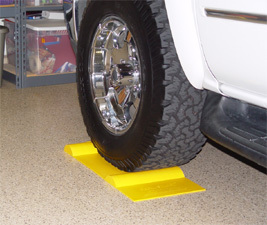 You can purchase/make a parking stopper for your car. If you are going to make one, get an old piece of carpet and short piece of wood at least 1 inch in diameter. The carpet needs to be long enough that when folded, it will fit under the tire. Loop the carpet around the stick with the excess carpet toward the garage door. The weight of the vehicle will hold the stopper in place. Once you get to the stick, you will feel resistance to moving the car further forward. As pointed out by Holroy, this method is subject to sliding around. Some glue would help to prevent the sliding. Your flooring will dictate the type of glue necessary. Another option, if you find it hard to build a movable stick, fasten the parking stopper, or don't trust the tennis ball, is to make a bumper or fender on the wall. I.e. one made out of foam padding or porolon. A simpler variant, is to glue a piece of foam padding, i.e. 4 inches thick, to the wall, and then insert a little stick with a flag on top of it. Glue it on the wall in a height where the front bumper will touch it, and when it does, you'll see the flag wave at you. PS! You could use an old mattress (or part of it) for this trick. Just fasten it to the wall, and hit it gently. Then you are home safe with the parking. I like marking the wall with something (e.g. permanent marker) to line up with the mirrors. Just park the car carefully, then mark on the wall where your wing mirror is, then in future just drive forward until your mirror lines up with the mark. Simple and cost-effective... No need to purchase anything or hang things from the ceiling. The solution lies in almost crashing into the wall without damaging the car. This can be achieved by mounting a light movable stick to the wall, or very close to the wall. Attach something visible to the top, so that you easily identity when you hit the pole, but before you crash into the wall. 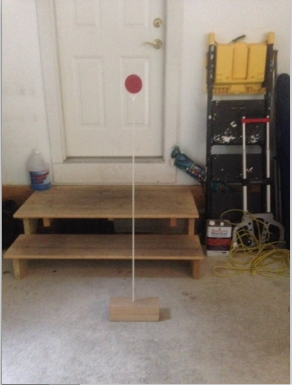 The pole or stick could be mounted at 2 or 3 inches from the wall, leaving 6 or 5 inches for the garage door! Park your car driving into the garage backwards. Use both your side mirrors to align the car with the garage. Use the co-driver's side mirror for side to side navigation. Make a mark on the wall that aligns to the mirror when parked in deep enough. With a bit of training you can keep your eyes on the co-driver's side mirror the whole time while parking. You can also get quite close to the wall on co-driver's side, which leaves lots of space to climb out of your car. I'm using this method for a garage that goes deep in but isn't comfortably wide. Marking the wall is an addition to my method with regard to the depth of the garage. Since I'm only looking at the one mirror that's supposed to align with the marking in the last phase of parking this should work fine. I have such a garage and the visible marker technique mentioned by many here works for me. There is a electrical socket on the side of the garage. I make sure the electrical socket lines up with the end of the front passenger door of my minivan. This gives me about 3 inches every time. Just make sure you don't lean too much forward in your seat when you check alignment with the marker. There's multiple things you can do to prevent hitting the wall. Install a closet mirror on one side of the wall. That way you can see how close you are to the front wall. Install a guided laser beam and pick a spot on the windshield. Some kits have two lasers, for two car garages. I find these to be a lot of work to setup (mounting, power, alignment, etc). Install a tire plate and chuck that prevents your front tire from going past a certain point. Yes, they may slide. Some have 4 holes to anchor them into the floor. Might be overkill. My car had a reverse-camera, so I would always back in. You can look into aftermarket kits if your vehicle doesn't have one. Tape method. Place a piece of tape on the floor that lines up with some letter or sticker on your door sill. At most you open your door half way as you pull in, staring down until the tape lines up with some mark on the door sill. Have someone you trust watch the front of the car when you drive in, drive very slowly until they say "stop" when you are 4-5 inches from the wall, so you are in the garage enough. Then back up, and do it again a few times. Once you're comfortable knowing how long your car is on the bit you can't see (lower front bumper), then drive in slowly and stop where you think you should, with the person watching to shout "stop" but only at the last minute. I know 5-6 inches sounds like already the last minute, but once you have done this a few times you'll recognise that nearly half a foot leeway is actually quite a bit. And you only need to be less than 8 inches away from the wall, which is nearly 3/4 of a foot. This will teach you the length of the car, and will allow you to park your car anywhere. The tennis ball and sticks ideas are truly great, but they are not present at the supermarket, golf club, or other places you could park where there could also be limited room. Or where you want the car parked tight in so no-one catches the back with a trolley/other vehicle/etc. It also helps you have more confidence when pulling out of being parked between two cars (front and back) in a street. 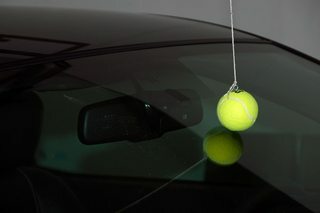 While you'd need to "re-learn" if you changed your car, you also have to reposition sticks and tennis balls too, but with this method, once you have the technique and experience, then learning a new car is pretty simple. Put something soft on the wall, like a foam or rubber fender. Then you can drive, slowly, until you touch it. Even plastic bottles will do (depending on the gap). I've often seen boats with empty plastic bottles or fenders hanging all around to avoid scratching the boat when docking. 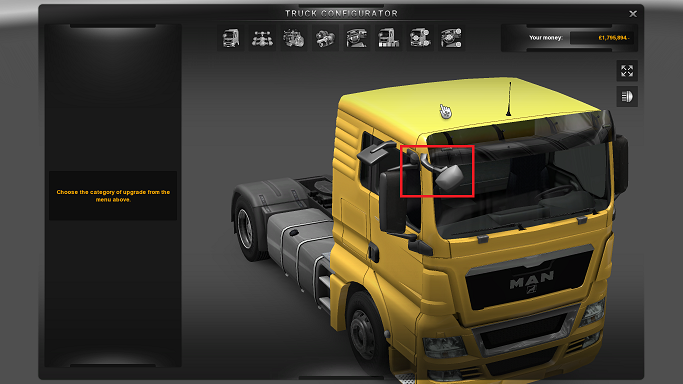 You can combine the fenders with a noise/light signal. Just put a contact switch behind the fender, connected to some sort of light. When you touch the fender the light will go on and you'll know you have to stop. Not the answer you're looking for? Browse other questions tagged car organization garage or ask your own question.